sign up below or call us at 704-568-2447 for a no charge initial consultation. 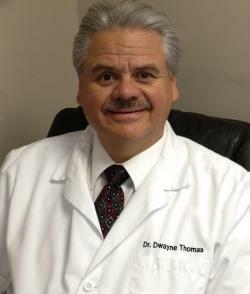 Dr Thomas grew up in the Charleston, South Carolina area. He graduated from Brigham Young University in Utah in 1981 and from National Chiropractic College in Illinois in 1984. He has a Bachelors degree in Human Biology and a Doctorate degree in Chiropractic. Dr. Thomas uses a variety of Chiropractic techniques to include Diversified, Cox Flexion-Distraction, low force Arthrostim Instrument Assisted Adjusting and he is also certified in Acupuncture Therapy. Dr. Thomas enjoys working with his patients and understands the importance of treating the underlying cause of pain. He put great importance on the value of Wellness or Preventative care which keeps all of the joints functioning as they should so his patients spend less time recovering from illness and injury and more time in normal daily activities. Dr Thomas opened his office “Thomas Chiropractic Clinic” in Charlotte in 1988. He has a passion and love for chiropractic care as he has seen so many people helped through the years. Outside the office, Dr. Thomas is very active in his church where he has served in a number of leadership positions. He has also been very involved in the Boy Scouts of America through the years and is a recipient of the Silver Beaver Award. He and his wife Sarah enjoy spending time with their five married children, as well as their eleven grandchildren. If you have any questions or would like to learn more about chiropractic care at Thomas Chiropractic Clinic, please call us at (704) 568-2447 today!